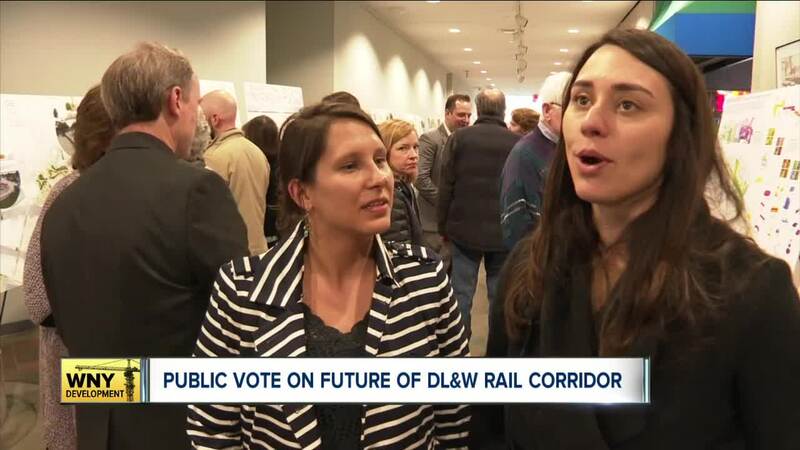 BUFFALO, N.Y. (WKBW) — The Western New York Land Conservancy held a public forum where members of the community could vote on their favorite option for the renovation of the DL&W rail corridor. "It's what a lot of people call an infrastructure reuse project" Jajean Rose-Burney, Deputy Executive Director of the WNY Land Conservancy said. 25 different options were were brought forward for the 1.5 miles worth of real estate that is going to be transformed. The land goes from Canalside to Solar City. "So we're going to take an abandoned railroad quarter and try to transform it into something that's really positive for the community" Rose-Burney said. All of the submissions had to have elements that could be used in all seasons. The public was allowed to vote on their favorites Wednesday night, with the winner not necessarily getting picked. A decision is expected in the next few weeks.